Not all of company improvement activity leads to bottom-line results. What is worse, some improvements do not always add value to the customer. Some lean efforts are nothing more than cost reductions that create road-blocks to lean transformation success. Value stream mapping is the best method for guiding the process of continuous improvements while increasing customer value. 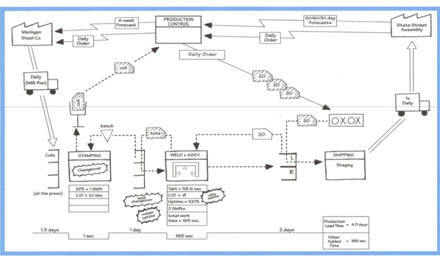 The most value in value stream mapping is being able to see and understand the whole value stream process. Departmental cost reductions are usually quick fixes accomplished at the expense of others and eventually are lost due to inadequate process management. Mapping helps to prioritize kaizen efforts aimed at making a bigger impact for customers satisfaction instead of just a shotgun approach. Finally, value stream maps help everyone agree on the current state and what their future state would look like. With this shared vision, everyone begins to move forward as a team and lean transformations exceed all expectations. * Working with the management team, our lean manufacturing consultant guides them through a manufacturing assessment via our value stream mapping process. The Objective: Create their "Current State" manufacturing map. 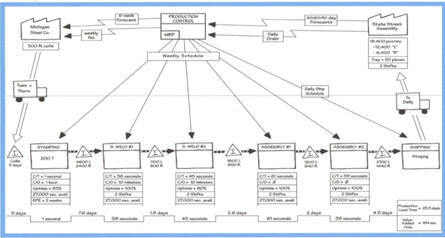 * Working with your management team, our lean manufacturing con--sultant guides them through their gap analysis and the development of their Lean Manufacturing Map (Future State). * Working with your management team, our lean manufacturing con-sultant guides them in finishing their Lean Manufacturing Map and the development of their Lean Manufacturing Tactical Plan. 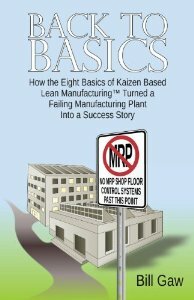 * Successfully integrated a lean initiative with MRP to improve their manufacturing performance... Benefit: Greater contribution to their company's bottom line. For more than 15 years, our 1700 plus customers and 15,000 plus news-letter subscribers have looked to Business Basics as a trusted developer of lean manufacturing training materials... manufacturing knowledge and implementation know-how that's helping individuals and companies exceed their goals and expectations. Our customer list speaks for itself. These companies are serious, as we know you are, about optimizing their company results and improving their bottom line. To review a partial list of Business Basics� customers simply click on our customers. Much less than you would imagine. In fact, we make our "lean manufacturing consultant service" affordable so that it can fit within your company's training budget. We want you and your company to learn how to get lean and/or leaner and the best way to do that is to make it affordable. Mike's typical manufacturing assessment, gap analysis, and Lean Manufacturing Tactical Plan budget would be for 40 onsite hours, with price held to a fixed fee of $9,500.00 (plus minimum traveling expense). Believe this, we will never consider your purchase binding until you have reviewed the finished project. We are certain that you will be thrilled with the results. In fact, we are so convinced that the assessment, gap analysis, and tactical plan will work for you that if you aren't completely satisfied for any reason at any time during the project, simply halt the project and we'll return your fee. You simply can't lose. "The Lean Manufacturing Assessment and Action Plan was a key contributor to a successful return to profitability at Eaton Leonard Technologies after we purchased the company out of bankruptcy. Stillman and Gaw, Lean Manufacturing Consultant, contributed greatly to improved manufacturing performance and a successful financial turnaround.."
is as risk free as an offer can come. Our preference is to meet with the CEO and Operations leader at the factory site where the proposed project would take place. A morning "get acquainted" meeting and plant tour is usually sufficient to cover the above subjects and establish mutual understanding of project objectives and expectations. If agreement is reached and the project is approved, a project time schedule is established. If you think this training will help your com-pany but you're not in a position to make the final decision, may I suggest that you forward this Web page to the decision maker. He/she may thank you for your interest and initiative.